Homemade cinnamon rolls sound great in theory until you do the math and realize in order to have a warm cinnamon roll with your 10am coffee, you need to wake up about 5am. No thanks. I solved that problem and made the fluffiest, softest, and best cinnamon rolls I’ve ever had. 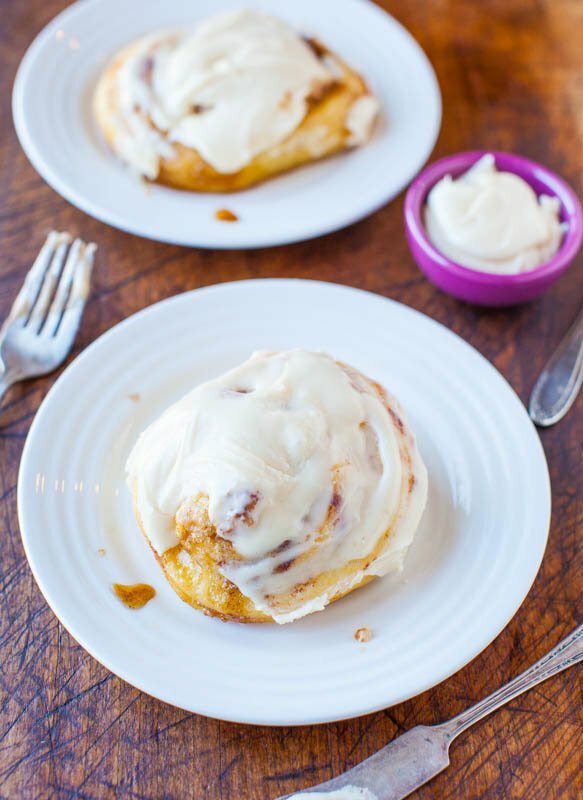 Every recipe out there promises the best cinnamon rolls, and I have more recipes to try. 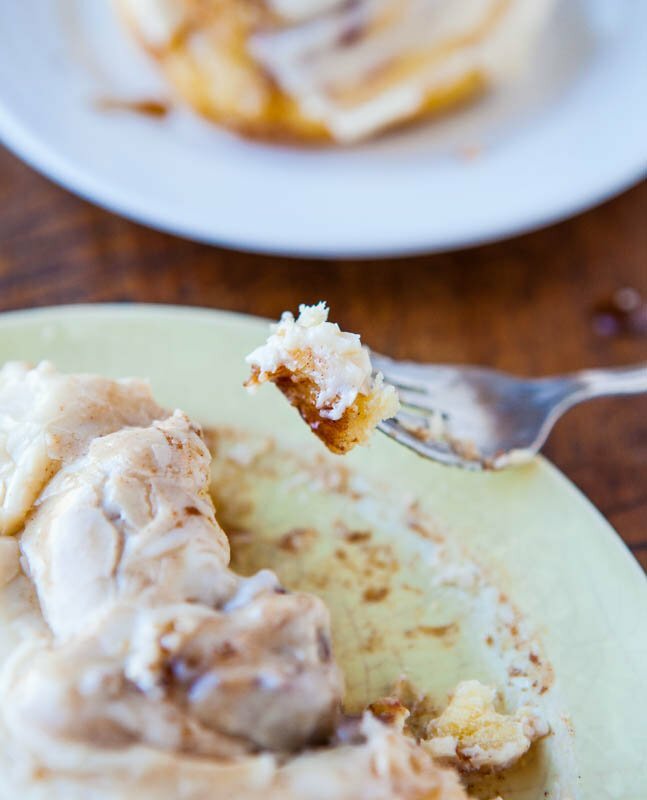 Consider this the first installment in my Cinnamon Roll Recipe Showdown, but to date these are the best cinnamon rolls either my husband or I have ever had, and I’m super picky. The next recipe will happen when I have time to work in an extra cardio to make up for all the fluffiness I consumed. Even if you’ve never worked with yeast or made cinnamon rolls, this recipe is do-able, but it’s not for everyone. There are no shortcuts, this is not bread-in-a-hurry, which is why I made the recipe work as overnight rolls. 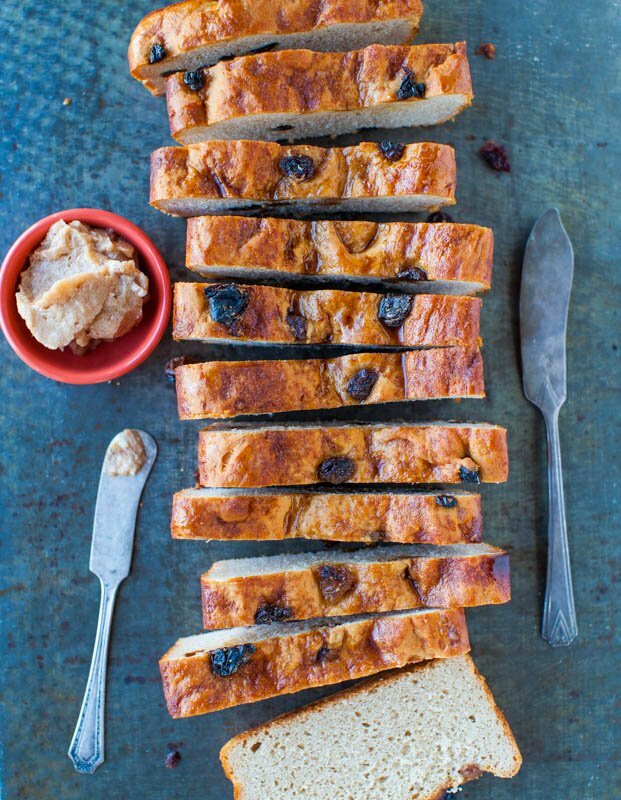 At 5am the last thing I am is wide awake and wanting to dive right into a yeast bread recipe. However, you can make it through if preferred, and start to finish you’re looking at about 5 hours. 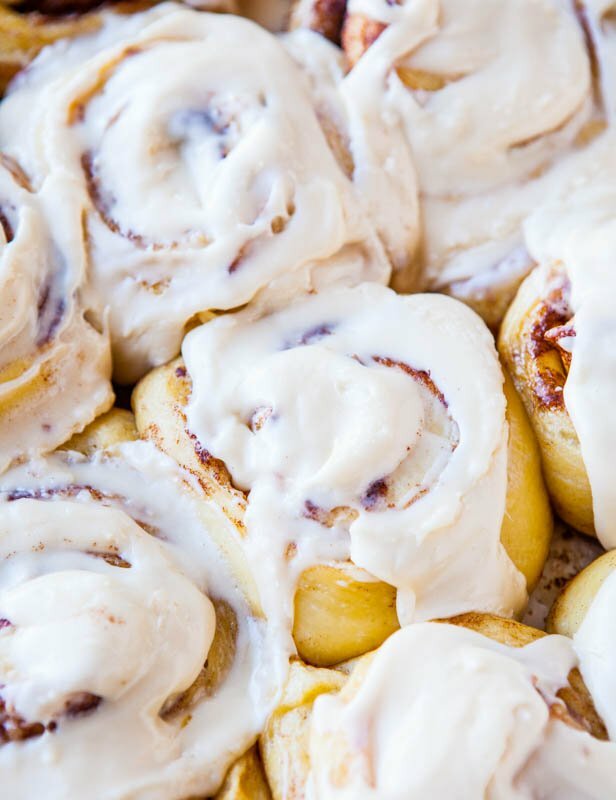 You’re either getting up at the wee hours, or you’re having afternoon cinnamon rolls. A stand mixer will make your life immensely easier because the dough needs to be kneaded for a minimum of 10 minutes, but you can do it by hand. And in the process, you’ll burn off enough calories that you easily deserve a couple rolls. If you want no-knead, make Challah or English Muffins. I wrote the recipe in the recipe section (below) as clearly and descriptively as possible, and before making these, read it over at least three times so you know where you’re going, what’s next, and more importantly, how much butter you need to set aside. To the bowl of your stand mixer add four cups of all-purpose flour, instant dry yeast, sugar, optional salt. I love bread flour for producing extra chewy bread, rolls, and cookies, but for these rolls I didn’t want any chewiness. I wanted softness and fluffiness, and AP is the way to go. It has a lower protein and thus lower gluten content, meaning the finished rolls will be more tender and soft with less chew-factor. I used Red Star Platinum yeast, which is my gold standard. It’s an instant dry yeast so you don’t have to proof it first with water and wait for it to get bubbly and foamy. Just sprinkle it right into the bowl with the other ingredients and then pour the liquids over the top of everything. When I deviate from Platinum and use other yeast, my dough doesn’t rise as well and doesn’t bake up as puffy and fluffy. Let the dry ingredients hang out in the mixing bowl while you melt some butter, lightly beat 3 eggs, and warm the buttermilk. I warm it in the microwave for about 45 seconds in a glass measuring cup. If after warming the buttermilk, it’s separated or gotten a little foamy, whisk it and it will smooth out. The type of yeast you use and the manufacturer’s directions will dictate the necessary buttermilk temperature. For Platinum yeast, the water should be warmed to about 120F to 130F, which is notably warmer than most other instant dry yeast, which typically call for temps in the 100F range. Follow the manufacturer’s recommendations for whatever yeast you use. Some people just dip their finger into the liquid and if that’s the method you’re using, err on the side of warm bath water rather than hot because you don’t want to risk killing the yeast. In bread-making, I don’t like to guess and always use a candy thermometer. I just never use it for candy. I urge you to buy a (cheapie) thermometer. They’re about $5.99 at the grocery store, Bed Bath & Beyond, or Target. It could save you from a bread fail and if you’re going to go to the work of making cinnamon rolls, having one is a no-brainer. Beat the dry and wet ingredients together with the paddle, and after a minute, switch to the dough hook. Moist, wet batter will be stuck to your paddle and just pick it off as best you can. 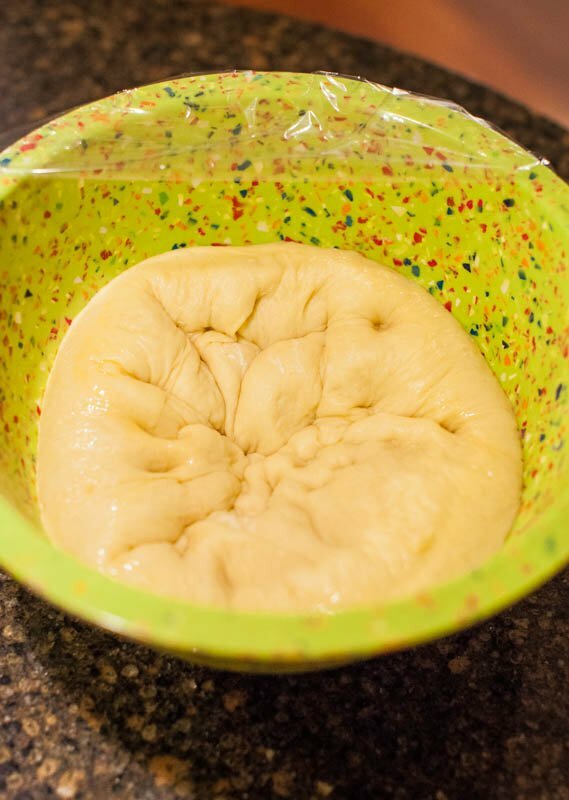 Allow the dough hook to knead for 10 to 12 minutes. If after 5 minutes the dough is still extremely wet and sloppy and not coming together, add one-quarter cup more flour, one tablespoon at a time, until it firms up. The most important thing you can do in this entire recipe is trust that the high moisture level of the dough is high and not over-flour it. The more flour you add, the denser the dough becomes, and the heavier the rolls will be. 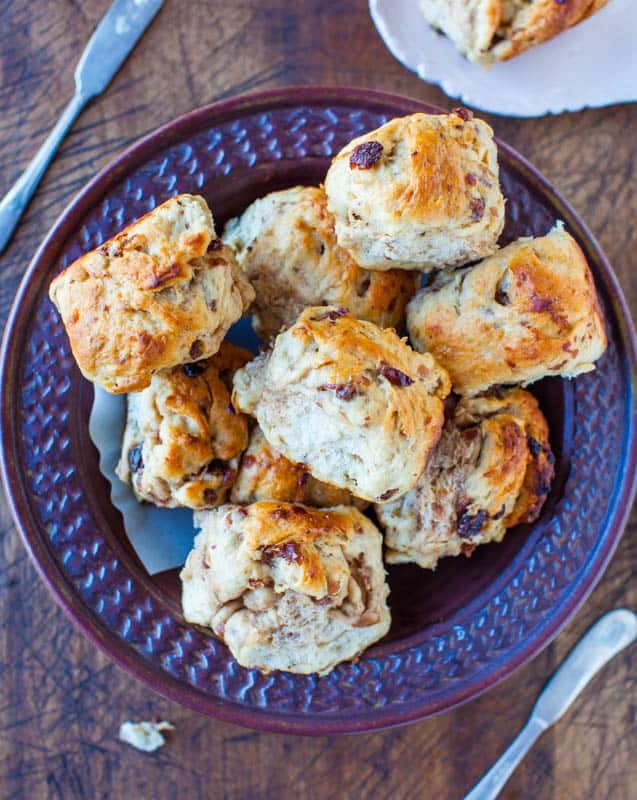 No way to have fluffy, light rolls with dense dough. It’s nice in theory to have a smooth, round, mound of satiny, non-sticky dough, but that’s not this dough. It’s wet, gloppy, moist, messy, sticky, and of all the bread I’ve ever made, this dough gets the award as the sloppiest. I was cursing it. I wanted to add flour so badly to it. Another half-cup and it would have been that satiny, smooth globe I love to see, but resisted the temptation and so should you. When kneading in a mixer, the rule of thumb for this type of dough is that it clears the sides of the bowl, but sticking the bottom of the bowl is fine. Transfer the sloppy mess to a cooking-sprayed large mixing bowl, cover it with plasticwrap, and let it rise for 2 to 2 1/2 hours, or until doubled in size, in a warm, draft-free environment. The sloppiness factor will diminish as the dough rises and all the moisture helps create light and fluffy rolls. A trick for creating a warm environment is to turn on the oven for one minute to 400F, then shut the oven off. Repeat: don’t leave the oven on, you are just blasting in hot air for one minute only. Quickly slide your bowl into the oven and let it stay there to rise. It will be about 85F inside the oven after the brief one minute blast. This tricks the yeast into thinking it’s a nice, warm summer day in your kitchen, which is how do their best work. For the 2 1/2 hours the dough bowl was parked inside my powered-off oven, I powered it on 3 times, every 45 minutes or so, for 1 minute each time. This kept the oven toasty because it was a cold night I made the dough and the oven and my warm environment was cooling off. Just look at the blubbery, wobbly, jiggly puffiness after 2 1/2 hours. It was literally pillowy soft. It felt like I was punching a pillow. Pssssssss. Deflation. Trapped gases released. Talk about a limp, deflated state of affairs after the punchdown. On a floured Silpat or counter, roll the dough out to a large rectangle, about 16×10 inches. I didn’t measure with a ruler because I know that’s just slightly larger than my Silpat, so I rolled it about that size. 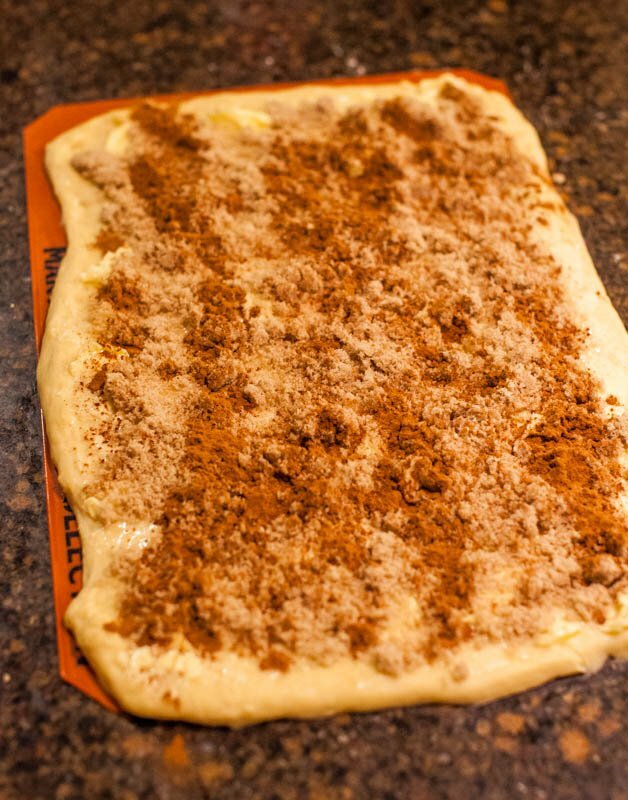 Spread a stick of very soft butter over the dough and sprinkle with about 1 cup brown sugar and shake on the cinnamon. I used almost 5 teaspoons cinnamon, but wrote to use 3 teaspoons in the recipe, or to taste. 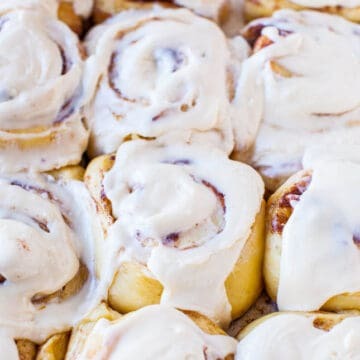 I love cinnamon, especially in cinnamon rolls, hence their name. In no way was 5 teaspoons overpowering. That’s a lot of dough and it needs to be properly flavored, but season to taste. Starting on a long edge (I started where you can see some letters on the Silpat peeking out), roll up the dough into as tightly coiled log as possible. It’s messy and if your log isn’t perfect, that’s okay. Slice it into 12 pieces and put them onto the baking sheet. For slicing, use a serrated knife or unwaxed and unflavored dental floss works great. You can pinch off the slices without compressing and squishing down the log. I used my trusty bench scraper. I used a large jellyroll or sheetcake-style baking sheet with a raised edge, 11-by-16-inches. You could use a 9×13 pan, but I prefer the jellyroll pan because the rolls are less squished, have more room to spread out and rise, and baking is more uniform. 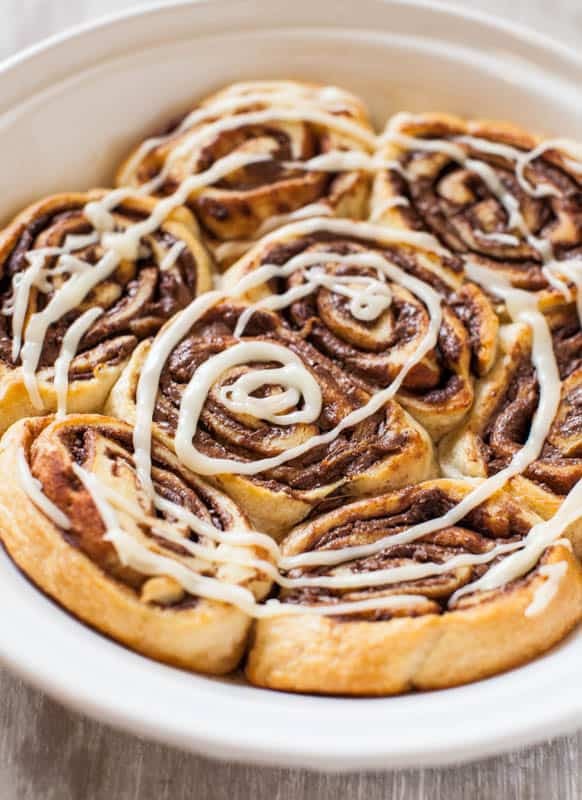 Some people complain their cinnamon rolls get too browned on the top before the center cooks through, which can happen if they’re too cramped in a pan. The jellyroll pan was $5.99 in my grocery store baking aisle and did the trick. I imagine that you could also make two eight-inch round pans. If you’re doing the overnight make-ahead option, slide the pan into the fridge and keep it there for up to 16 hours before baking the rolls. When it’s time to bake the next day, allow the rolls to come up to room temperature and rise for 1 hour on the counter, or until almost doubled in size. And then bake. If you’re making them straight through, allow the rolls to rise in a warm, draft-free place for 60 to 90 minutes, or until almost doubled in size. And then bake. Bake them at 350F for 22 to 25 minutes, or until lightly golden on top and cooked through, but not overly browned. I prefer these on the paler side. Nothing says dealbreaker like a hard or crusty cinnamon roll. After 12 hours in the fridge, this is what my rolls looked like. They sat on the counter for 1 hour before I baked them. I baked for 23 minutes, and rotated the pan once. It’s amazing how much they puffed during the 1 hour rise and in the oven. The term for it is called oven spring. Yes, they sprung, which is why I can’t imagine a 9×13 pan. While they bake, make the cream cheese frosting. However, if you’re doing the overnight option, I highly suggest making it the night before so it’s one less thing to think about the next day before you’ve had your coffee. Put the frosting into an airtight container and slide it into the fridge along with rolls. The next morning, take them both out at the same time. You want the cream cheese frosting to be very soft so that it spreads smoothly over the rolls. Immediately after taking the rolls out of the oven, generously frost them so it drips into all the cracks and crevices. And dig into a little piece of heaven. The recipe for cream cheese frosting, like all frosting, is dictated by personal preference. I simply use butter, cream cheese, vanilla, and confectioners’ sugar. Adding milk, cream, buttermilk, orange zest, almond extract, or whatever you like in your frosting is all up to you. The amount I made is in excess of what you may need for your rolls if you don’t like a lot of frosting, but I do. Plus, frosting keeps for a couple weeks in the refrigerator and I have also frozen it for months. When I am dirtying the mixer to make it, I may as well make a decent amount. Halve the recipe if preferred, but you’d be surprised that if you make it, people will want it and eat it. It’s not like making extra lima beans where requests for extra are nonexistent. A smear of extra frosting before nuking leftover rolls is extra wonderful. The rolls are best eaten fresh, but will keep in an airtight container at room temperature for up to 5 days. Reheat leftover rolls for a few seconds in the microwave before serving. If you have issues with cream cheese frosting at room temperature, then refrigerate the leftover rolls; I don’t. Soft, fluffy, tender dough that’s buttery and scrumptious. They’re as light and feathery as cinnamon rolls can get. They’re lighter and not as dense, heavy, and ‘bready’ as Cinnabons. They still are heavy and filling, but less like a ton of bricks in your stomach. Maybe just a half ton. While baking, the filling mixture of brown sugar and butter melts and caramelizes, producing a thick, sweet, caramely sauce, pleasantly spiced with cinnamon. 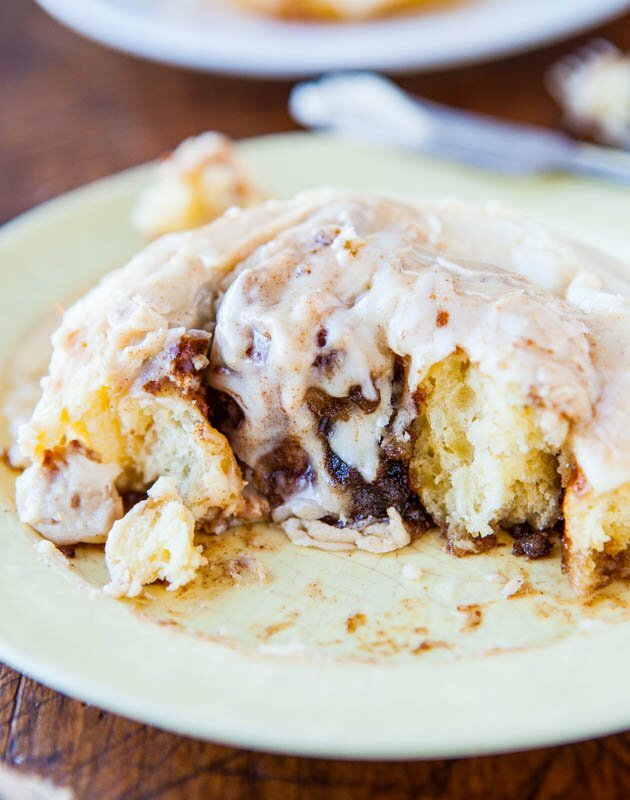 That saucy filling, along with melted frosting, is what a cinnamon roll is all about. 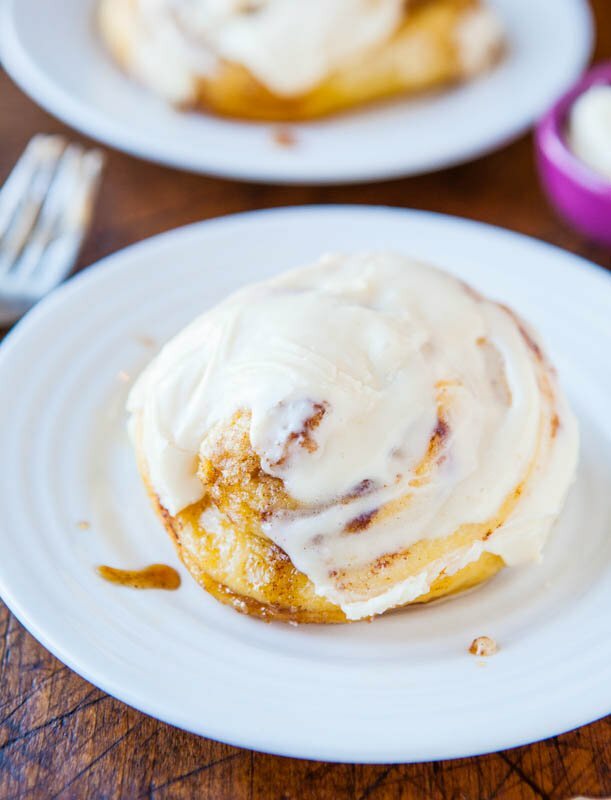 Just like Carrot Cake needs cream cheese frosting, so do cinnamon rolls. The frosting is tangy from the cream cheese, rich from the butter, and densely satisfying. There is nothing like homemade cream cheese frosting. So smooth, creamy, indulgent, and blissful. They were every bit as wonderful as I had hoped. Future recipes have their work cutout for them. To date, the best cinnamon roll I’ve ever had, and the family concurs. To date, the best cinnamon rolls I’ve ever had. They’re soft and fluffy and taste better than the kind you get at the mall. 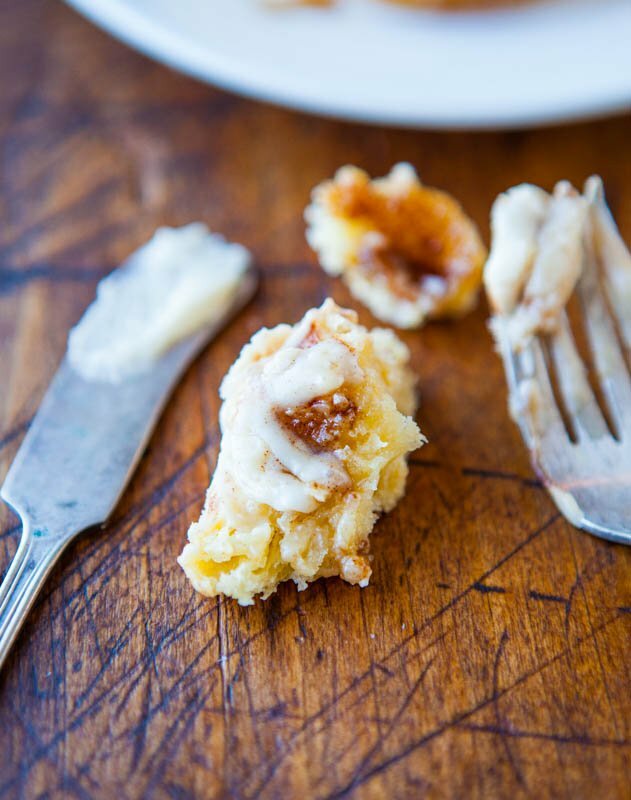 The recipe is very do-able even if you’ve never made cinnamon rolls. 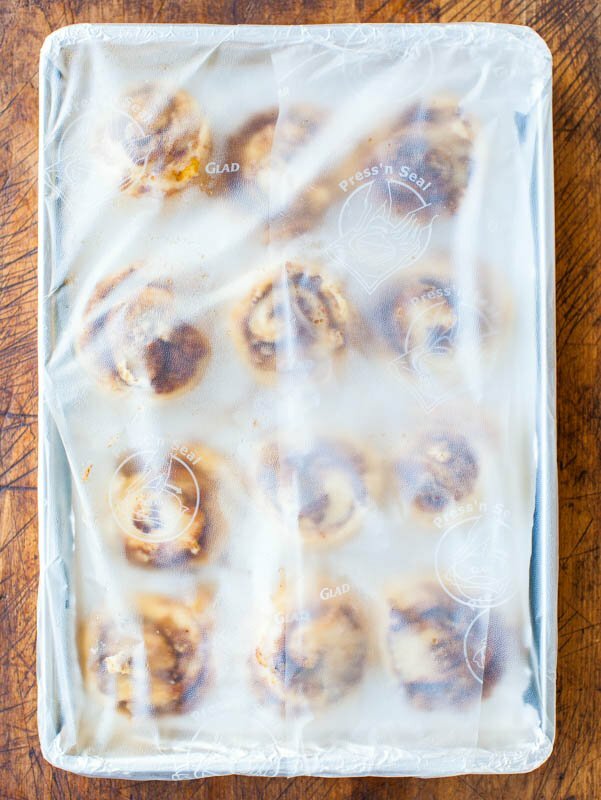 The overnight make-ahead option means you can wake up, pop cinnamon rolls into the oven, and enjoy fresh, warm, gooey rolls with your morning coffee. The dough is buttery soft, light, and fluffy. 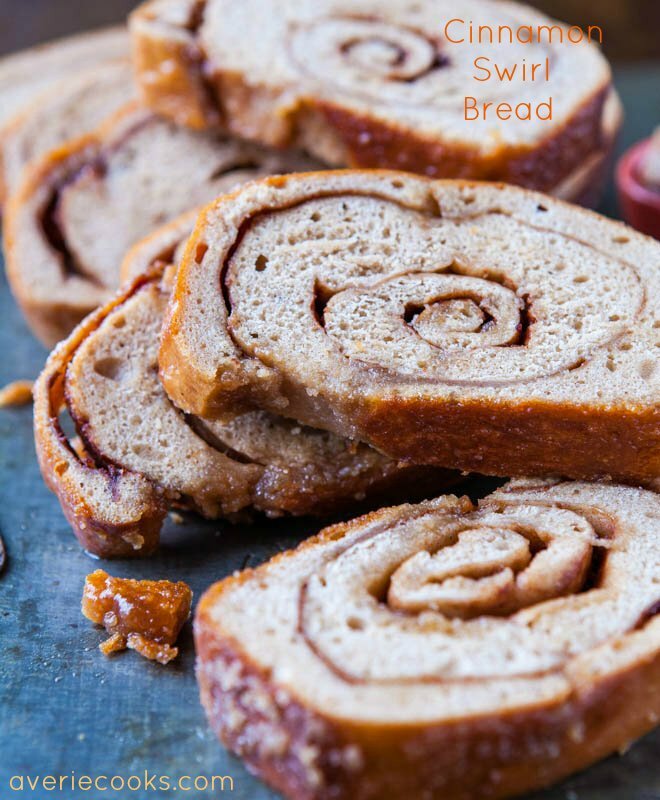 The cinnamon and brown sugar filling caramelizes and thickens while the rolls bake, creating a caramely, sweet sauce. The cream cheese frosting is a must-have and takes an already great roll into a league of it’s own. Dough – To the bowl of a stand mixer fitted with the paddle attachment, combine 4 cups flour, 1/3 cup sugar, yeast, salt to taste; set aside. Place 6 tablespoons butter in a small microwave-safe bowl, and heat to melt, about 45 seconds; set aside. Crack eggs in another bowl and whisk; set aside. Add buttermilk to a glass measuring cup and warm to temperature, about 45 seconds on high power in the microwave. (Based on the type of yeast used, milk temperatures will vary. Red Star Platinum yeast calls for warmer temperatures than most, 120 to 130F; other brands and yeast call for much lower temperatures, about 95 to 105F. Warm milk according to manufacturer’s recommendations on the packaging. Taking the temperature with a digital thermometer is highly recommended, but if you’re not, make sure the milk is warm, not hot. Err on the cooler rather than hotter side so you don’t kill the yeast.) If the milk separates or gets a little funny looking after being warmed, whisk it to smooth it out. To the dry ingredients in the stand mixer, add the melted butter, eggs, buttermilk, and beat on medium-low speed for about 1 minute, or until combined. 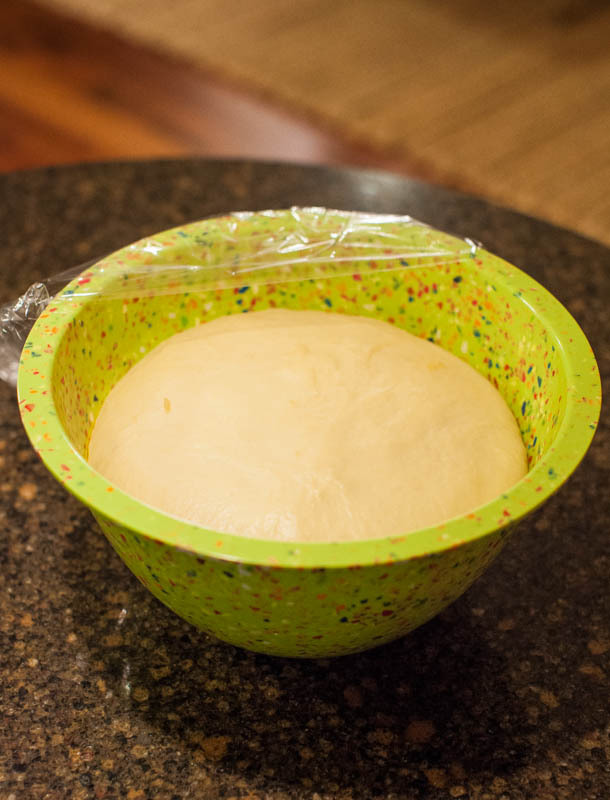 Switch to the dough hook (the dough will have stuck to the paddle and just pick off what you can and put it into the bowl) and knead for 10 to 12 minutes (15 to 18 minutes by hand). If after 5 minutes more flour is needed, add the remaining 1/4 cup flour, 1 tablespoon at a time, until the dough clears the side of the bowl but sticks to the bottom. This is a very sticky, tacky, moist, and borderline sloppy dough; don’t be tempted to over-flour it. It’s supposed to be that way. The more flour you add now, the less fluffy and more dense the rolls will be. Dough should clear the sides of the mixer while kneading but sticking to the bottom is fine. Remove the dough from the mixing bowl, spray a large mixing with cooking spray, and place the dough in the bowl. Cover with plasticwrap and place it in a warm, draft-free place to rise for about 2 to 2 1/2 hours, or doubled in size. I keep my bowl inside a powered-off oven. Every 45 minutes or so, I power on the oven for 1 minute to 400F, as if I am preheating it, then I power it off. Do not, repeat not, keep the oven on. These short bursts of 1 minute of heat create a stable 85F-ish warm environment, ideal for the yeast. If your rising spot is cold, it will take longer than 2 1/2 hours. Prepare a 11-by-17-inch or similar sized jellyroll pan or sheetcake pan with a raised edge, or use a 9-by-13-inch pan. I prefer a jellyroll pan because it’s slightly larger so the rolls are less squished, have more room to rise, and bake more evenly. Line pan with aluminum foil, spray with cooking spray; set aside. 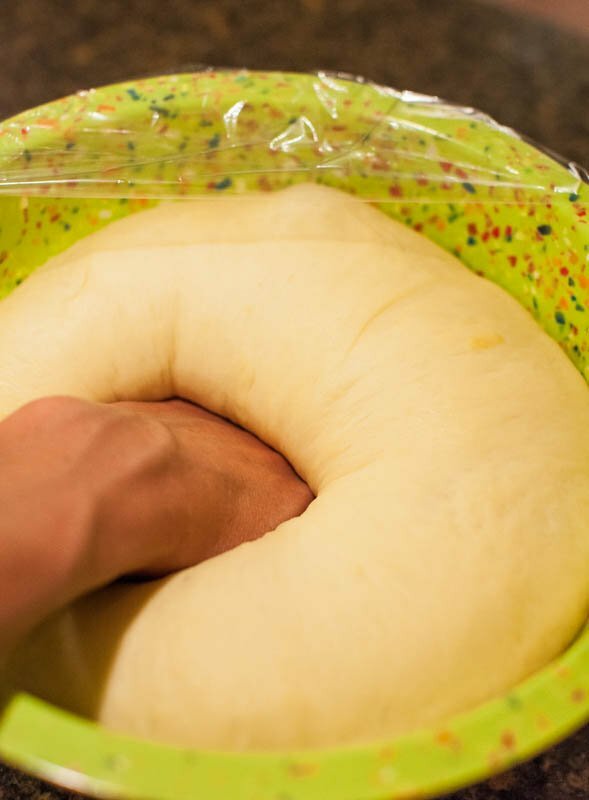 Rolling Out the Dough – After dough has doubled in size, punch it down. Turn dough out onto a floured Silpat or floured countertop. Knead it lightly for about 2 minutes. With a rolling pin, roll it out to a 16-by-12-inch rectangle; just slightly larger than a standard Silpat. Filling – With a knife, butter the dough with 1/2 cup soft butter, leaving a 3/4-inch border around the edges. Sprinkle the brown sugar over it. Sprinkle the cinnamon over the brown sugar; I was very generous with the cinnamon and used almost 5 teaspoons and recommend at least 3; just eyeball it and shake it on. Slicing the Dough – Loosen the dough from the counter using a bench scraper (or metal spatula), and starting with a long edge, roll the dough into a tight log. Pinch the seam closed and turn log so seam side is down. Gently stretch the log to be 18 inches in length with an even diameter all the way around and pat the ends to even them up. Don’t fret if your log isn’t perfect; it’s okay. Slice the cylinder into 12 evenly sized rolls (about 1 1/2 inches wide) using a bench scraper, serrated knife, or plain unwaxed dental floss (works great to not squish and compact the log). Arrange the rolls cut side down in the prepared baking pan. Cover with plastic wrap. Decide to Make Straight Through – Let rise in a warm, draft-free place until the rolls have nearly doubled in size, 1 to 1 1/2 hours. 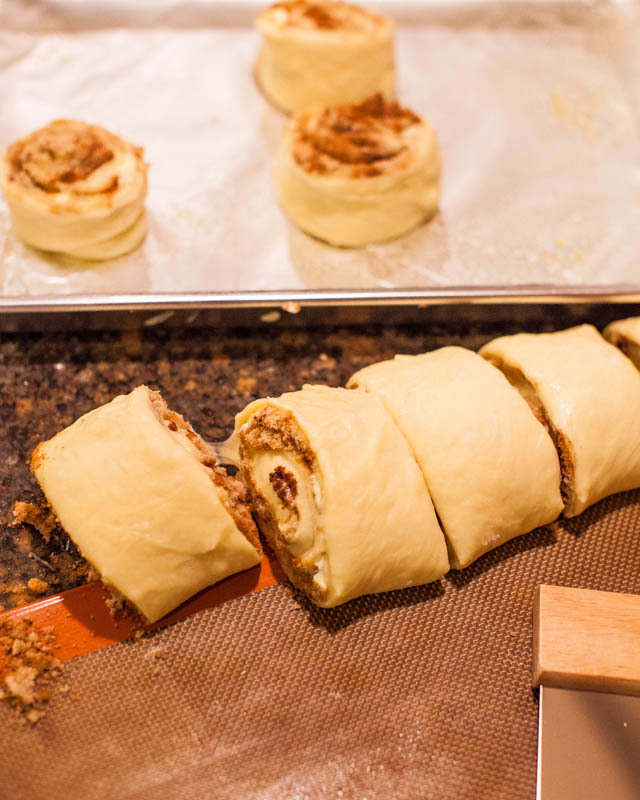 Or…Decide to Make as Overnight Rolls – Don’t let rolls rise after they’ve been sliced and placed in covered pan. Place pan in refrigerator for up to 16 hours. Before baking, let the rolls sit at room temperature until they have nearly doubled in size, about 1 hour. Baking –For either version, bake at 350F for 22 to 25 minutes, or until lightly golden on top and cooked through but not overly browned. 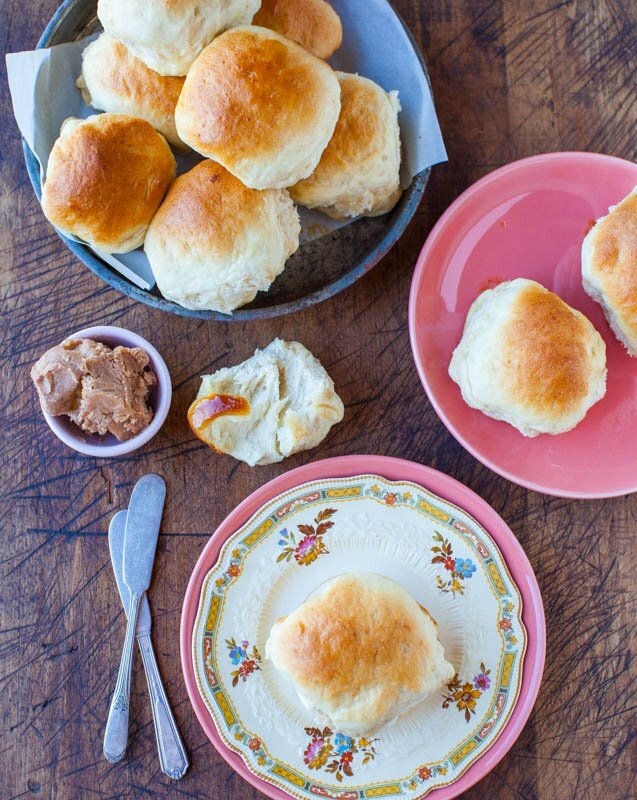 Immediately and generously, spread cream cheese frosting on the warm rolls. Serve immediately. Rolls are best eaten fresh, but will keep in an airtight container at room temperature for up to 5 days. Reheat leftover rolls for a few seconds in the microwave before serving. If you have issues with cream cheese frosting at room temperature, then refrigerate the leftover rolls; I don’t. For longterm storage, I recommend making the rolls as directed and then freezing unfrosted rolls; allow to thaw at room temp prior to serving and frost as directed. I prefer freezing finished rolls rather than freezing uncooked dough. Cream Cheese Frosting – I recommend making this at night if you’re doing the overnight version, refrigerating it, and taking out along with the rolls as they rise so when you need it, it’s well softened. Frosting may be halved (makes about 3 cups as written), but unused frosting can be stored in the refrigerator for up to 2 weeks and I have frozen frosting for up to 3 months; I’d rather have too much than not enough. 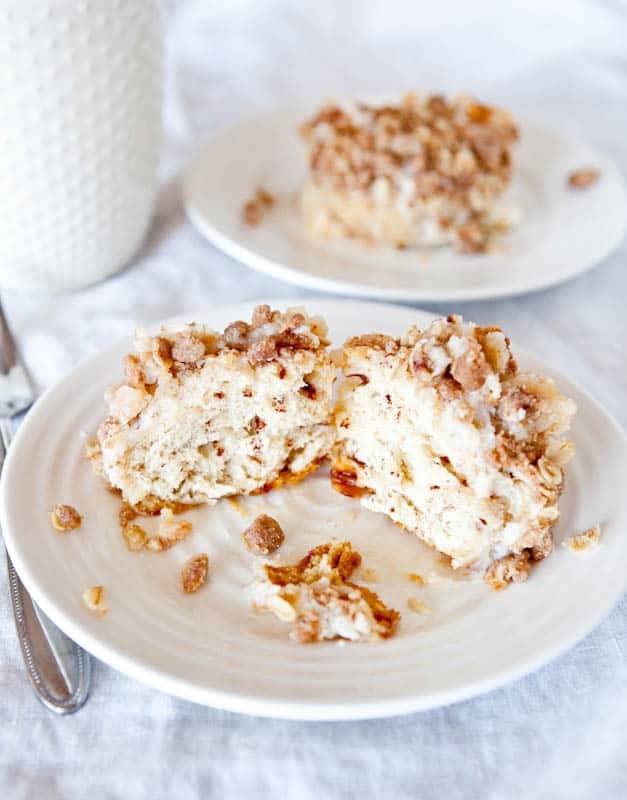 All measurements and ingredients are to taste; consider adding buttermilk, almond extract, orange zest, heavy cream, or your other favorite specialty tweaks as desired. I keep it very simple. To the bowl of a stand mixer fitted with the paddle attachment, combine 1/2 cup butter, cream cheese, and beat on medium speed to combine, about 1 minute. Add the vanilla, 3 cups confectioners’ sugar (I don’t bother sifting), and beat until smooth and fluffy, about 3 minutes, stopping to scrape down the sides of the bowl as necessary. Add remaining 1 cup of sugar (or more, or none) as necessary, to taste, based on desired frosting consistency and flavor. Dough base ingredients loosely adapted from America’s Test Kitchen Cinnamon Rolls; the filling, cream cheese frosting, preparation methods and techniques are my own. 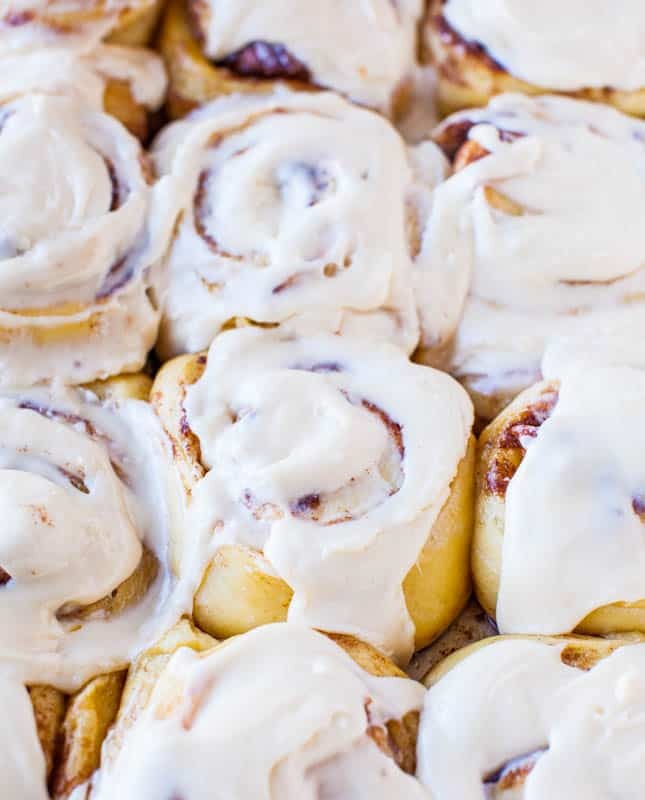 Have you ever made cinnamon rolls? Do you have a favorite recipe? Thanks for the Deluxe Six-Piece Bakeware Set Giveaway and Pure Protein Prize-Pack Giveaway entries! I’ve made these so many times now, and iI beentoo tell you thank you! My mom used to make the best cinnamon rolls I’ve ever had before she passed, but her recipe was just in her head! Every recipe I’ve tried has been ok, but a failure ultimately at re-creating her recipe. Until yours. I cried the first time iI th ate them because the taste immediately brought me back to her and her cinnamon rolls. She used a glaze instead of a cream cheese, but there taste after it melts it’s identical. I can’t thank you enough for these. Not only are they amazing just on their own, but you helpedmy family find a piece of mom again. Thank you! Thanks for the 5 star review and glad these rolls are ‘the ones’ that make you feel like you’re eating your mom’s rolls! What a lovely comment and so glad these are perfect for you! 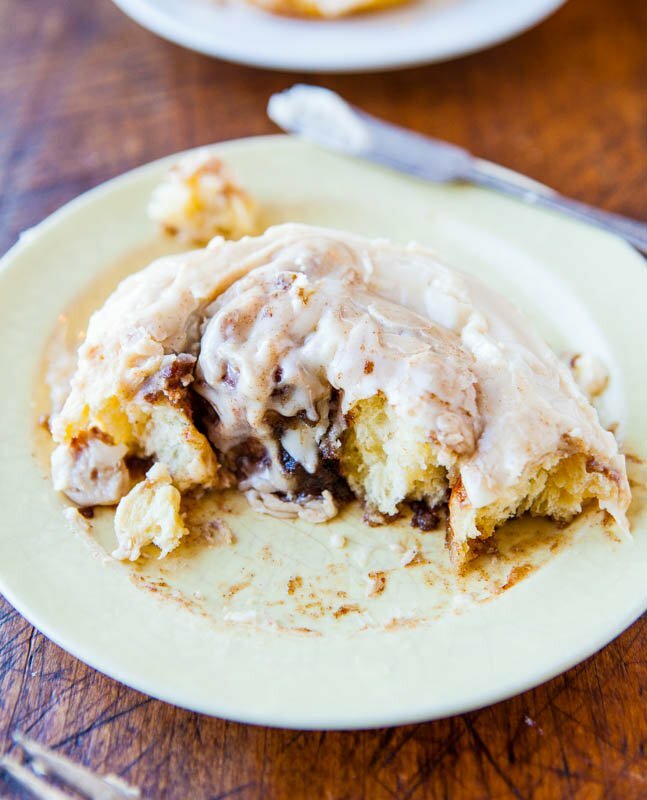 Thanks for saying that it’s the best cinnamon roll recipe you’ve ever had! PS if you look at it it seems like there’s a lot of steps, but I’ve found with recipes in general, especially anything to do with bread or yeast, if I’m not extremely specific and detailed, people screw it up. So I try to prevent that and save everyone a lot of frustration. I may just now be reviewing, but I’ve made this recipe at least 3 times! I made them at Christmas last year and the year before for Christmas morning and they were a hit with everyone. 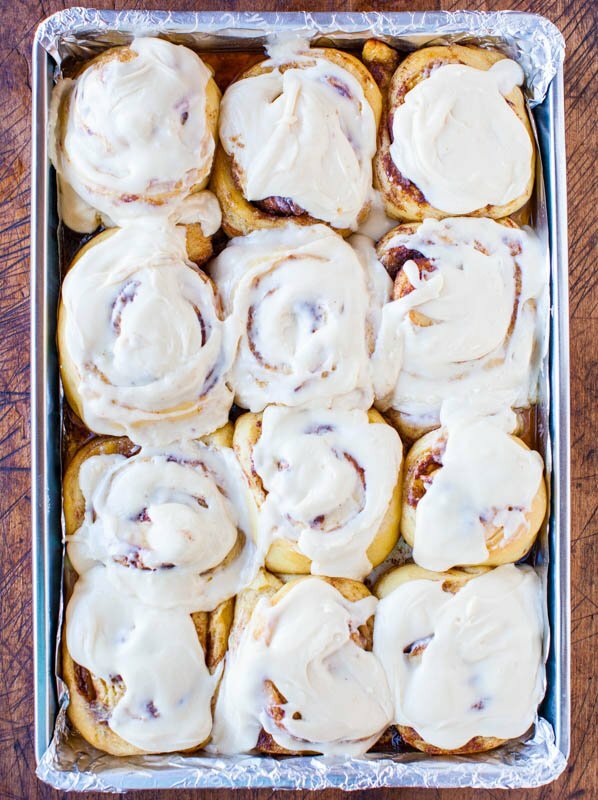 I looooooove how you can make the day before (and I may try making them 2 days before… not sure how they’d do an extra day in the fridge) and then just put them out and bake in the morning. And they are so fluffy! And delicious. I also love the icing, but even heaping it on I only use 1/2 to 3/4 of it. But I love love love this recipe!! It has become a family favorite. Thanks for the five star review and I’m glad this is a family favorite! You can always halve the icing recipe if you find it’s too much for you. Thanks for the five star review and I’m glad these are you go-to for Christmas morning! 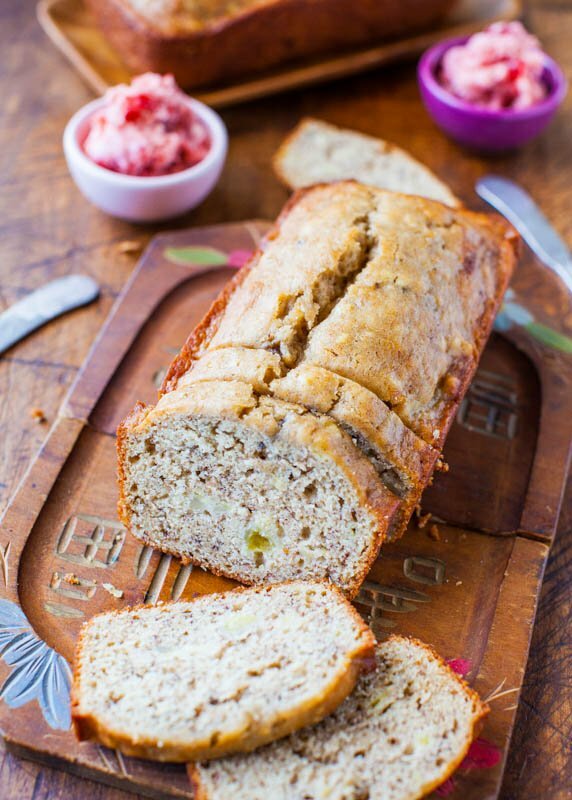 I’ve made this recipe several times and it is my go to! Delicious rolls topped with decadent cream cheese frosting, how can you go wrong? I need to make 3 dozen for a wonens retreat in a few weeks, have you ever frozen the rolls or the dough? I’d love to take them frozen, leave them out on the counter to come to room temp then bake them? What are your thoughts? Thanks for the five star review and I’m glad you love these rolls! I would say in answer to your questions, I never have done any of the above so I would just make a test batch, maybe halve it – do one thing with one half and see how that goes, and another variable/thing with the other half – and then decide what’s best for the retreat. Good luck! I love this recipe and have made these often. Just wondering if anyone else has experienced the sugar being a bit crystallized and gritty? I wondered if I mixed the butter and sugar together if that might help. This dough is really amazing and I love that I can make them the night before. I still gave it 5 stars. Thanks for the 5 star review and I’m glad you make these often! I have never had any issues or read from anyone that’s written in with the sugar issue you’re talking about. Maybe as you said you could try doing what you suggested and see if that helps in your case. 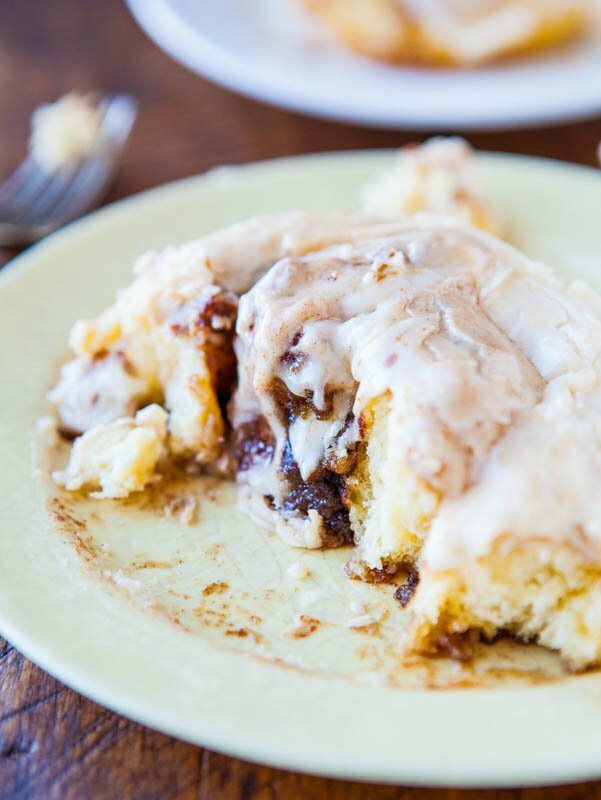 These cinnamon rolls were easy to make and were quite possibly the best I’ve ever eaten….and I’ve eaten more cinnamon rolls than I care to admit! My husband declared them in the top 3 sweet things I’ve ever made in the 21 years we’ve been married (the others being lemon bars and coconut cream pie). My children loved them so much that they were sneaking the rolls out of the kitchen to eat them in secret! I don’t know how they taste the next day…they didn’t last 12 hours. The rolls were soft and pillowy, exactly what I was looking for. I loved that I could refrigerate them overnight. Next time I’ll probably make a simple glaze. I liked the cream cheese frosting but most of my family doesn’t like cream cheese. If I could give this recipe 6 stars, I would. This is going in my permanent cookbook…. the one my children are already calling dibs on! Thank you for sharing it!!! Thanks for the 5 star review and I’m glad they were quite possibly the best you’ve ever eaten and top 3 things you’ve ever made! !